Oh please tell me you didn't think it was ME going to the boutique? bwaahahahahaha! Every year Jim and I shear our Puzzle sheep ourselves. He has a huge hole in his heart and has to stand up for his haircut. If we set him on his hinder like the other sheep for their haircuts, he can't breathe. Not good. Not good at all! SO, Saturday we got to work. Milo (left) and Fletcher (right) were the set up crew. The llamas were the supervisory committee to make sure the set up was properly carried out. Puzzle said this is a big 'no go.' Not again? Before. Oooh la la!! Half way there... My guardian stayed with us the entire time. This was the first time he had seen a sheep sheared. He was a little worried. (Fletcher) Thanks to a brand new pair of scissors, a lot of giggling by me and Jim- two hours later wa-la- all done! The aftermath- Milo was not interested in clean up detail. All of our sheep are special but Puzzle is a little extra special. He was not supposed to live past a few months after he was born. He just turned 3 YEARS OLD! You've beat the odds you sweet sheep! Every day we get to spend with you is a blessing my little peanut. (And I am glad you don't mind standing sort of still for a rather iffy haircut too.) You are my hero sheep Puzzle! Jim & Sandy Ryan & the Sheeps ...where sheep may safely graze. Joy to the wooled!!! !This year we had the nicest weather on shearing day we've had for years. It was nice and WARM! Generally it is a cold, windy day. Hooray! This is our new guy- Ryan the Wonder Shearer! Our shearer of 15 years is retiring. Ryan worked with David at times over the years. We are so lucky to be on Ryan's shearing route now! He was very kind to our sheep, patient and did a great job. Thank you Ryan! (This is Patch having his haircut.) Miss Lily the Shetland sheep was not enthused. We locked the sheep in the barn the night before shearing. Tricked all of them in with grain except the Dirty Dozen. We spent over an hour just chasing those 12 sheep into the barn. They finally got tired thank goodness- we did too! Lily was not one of the Dirty Dozen but she is representing for the disgust of the other sheep. FOOLED! Curses! Foiled again! Our day started out early. Thanks to all the help from our friends Mary, Heidi and Jon the day went quickly and a good day's work was done. The sheep were busy trying to find their friends again. Everyone looks different with their haircuts so it takes a few hours for everyone to settle down. Then it was time to have a snack before bed time. 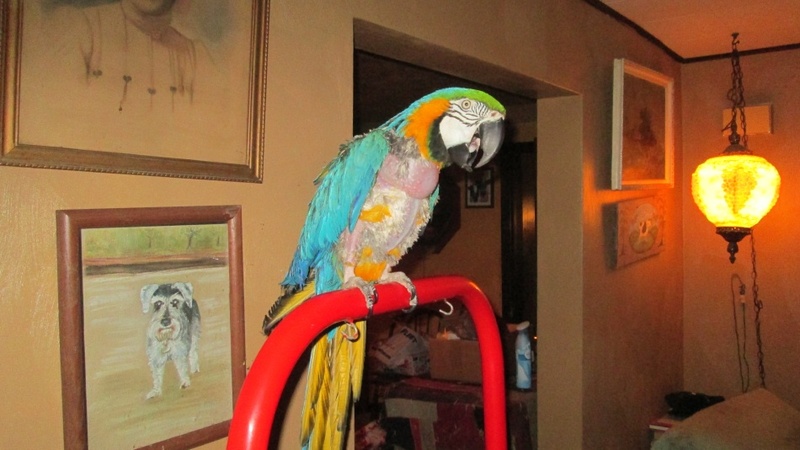 This is Mario, showing us his 'good side' to be sure we knew he was not getting tricked again. Not sure if he was trying to crawl into the bale to hide til his fleece started growing again? The old I can't see you so you can't see me? We always have the most beautiful shearing day sunsets. We were so tired the fleeces didn't make it inside until the next day. Mission accomplished though- thanks to my wonderful hubby Jim. Since last week I have some headway in my poor fiber palace. The fleeces have the sheep's name inside the bag; then the fleece/bag is rolled up and taped up with the sheep's name on the outside of the bag too. I have a special room full of shelves just for the fleeces. I like to keep them arranged by breed so I can just go get them when I am ready. Takes too much time to search through them otherwise! Now I will keep working away, sponsor fleeces will be set aside to work through and there will be a LOT of wool hitting the website. There are so many things I love about shearing day. Each sheep's fleece is like opening a present. Colors change over the course of the year on almost every sheep. The smell of a sheep and their wool is amazing to me. Almost like the smell of a horse's soft nose. Having such a nice fiber palace (aka basement) is a gift. When I am sorting through fleeces it feels like I have my sheep friends inside with me. We all know what a disaster that can be so fleeces for me right now! ha! One more sunset including happy, comfy sheep. I am so blessed to have all that I have here. Thank you hubby Jim for putting up with me! Keep an eye out for all the new wool on the sheep's website. For now be sure to visit the 'batt page.' 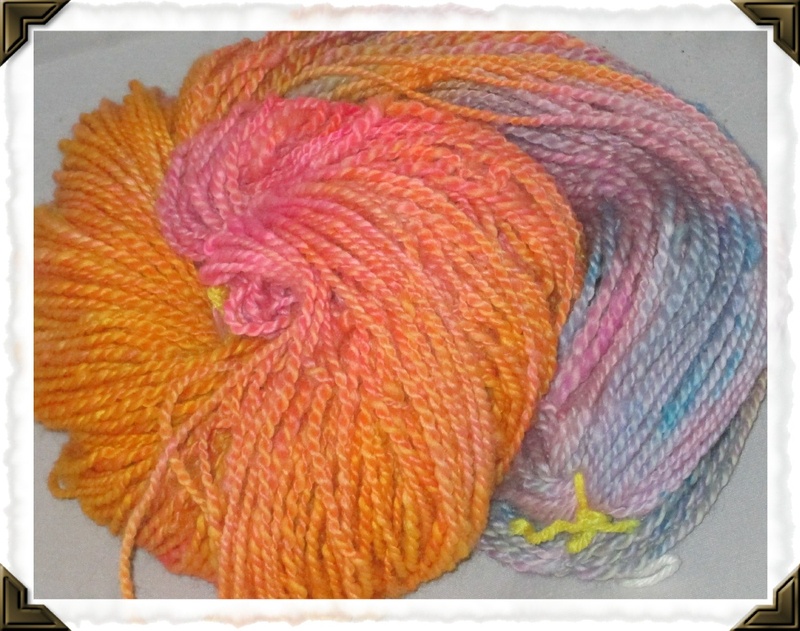 It is loaded up with Mary's Crazy Quilt batts that would be fabulous in your next project! Smooches from the sheep and hope all is well sheep peeps! Jim & Sandy Ryan www.homesteadwoolandgiftfarm.com ...where sheep may safely graze. If you follow the sheep and their cuteness, you also know how hard it is for me to keep them focused on work. They really only have three 'jobs.' Be cute, grow pretty wool and be healthy. Once in a while though, it IS nice to have some help. The sheep are very creative and love to card batts. They bicker and fuss waiting their turns and the girls throw sparkle around and it gets into the boy's creations-which the boys do NOT appreciate. Then there is bedlamb in the fiber palace. Sigh. Now that it is feeling like Spring, Arthur is showing you just how he looks at me- work? Yeah right. Now the sheep have more help! My friend Mary is spending time with me in the fiber palace once a week. Keeping the sheep under control, monitoring turns AND carding up gorgeous beauteous batts! Mary and I have been friends for a very long time now. You've probably seen her llama, alpaca, Angora rabbit AND Angora goat fiber available on our website. I have always wanted to have a very big offering of batts available for sale- and Mary is making it happen. Mini-Crazy Quilt Batts! Ooh la la!! SO, welcome to the fiber palace Mary! I am so happy to be spending time with you AND keeping up with my fiber projects. You are a peach! Be sure to check out the batts- the sheep and I have created some new handspun yarn styles so keep an eye out for that too ok? Shearing day is April 14 this year. More info to follow so stay tuned! Hope you are all well and enjoying the almost spring time weather! I have so many beautiful pictures of our sheep that have not been 'out in the public' yet. SO, here we go! SO, we have so many great sheep and great pictures- most of these taken by my friend Heidi Ellefson. She has such a talent catching the sheep's expressions! Be sure to check out the sheep's website ok? Lots of new items for sale- the sheep said you might want to sit down with a big cup of coffee to browse! Smooches all! Jim & Sandy Ryan www.homesteadwoolandgiftfarm.com ...where sheep may safely graze. Even though it is cooooold outside! Each year I fuss about the weather. I need good sheep weather. Cold enough they don't get too warm, but not too cold either. Happens every year to my fussbudget self... Bundle up for chores, weather man says it is 30 below zero wind chill and outside I go. 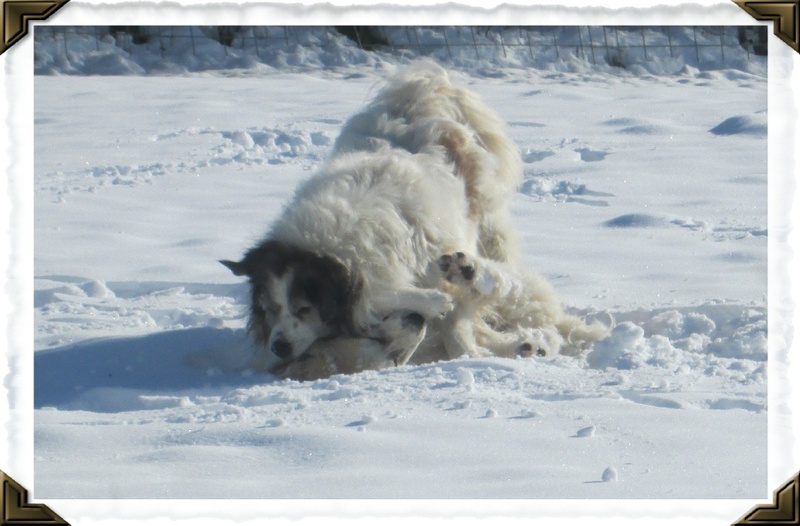 The Pyrs are happy, playing ON the snow that has now become ice. First step out the door and I contemplate the idea of adding a pillow as padding to my hinder. Nope, already one foot outside. Gotta go through with it right now. Because my sheep desperately need me to keep them warm and comfy right? And what do I see as I look out? Oh, funny funny sheep. This is NOT what I see. THIS is what I see. So they really don't need me? Looks like some fun sheep shenanigans going on to me. Guess if the sun is out life is good?! Maybe my idea of cold should be adjusted? Hmmm. ANYhoo, while they are out having fun I am working on adding some new items to their website. Hope you can stop in and see if there is anything you absolutely cannot live with out for your next project!! Lots and lots of fun for everyone- with some sheepie specialness included! The sheep are sending hugs to keep you warm! The sheep went on strike the other day. The only office type help I got was they threw the mail and boxes on the back porch. Then they were off again. Doing what sheep do. Arthur and Greta giving a perfect example of what sheep do... (photo from last summer- some things never change!) SO, the Pyrs decided to help me out instead. First Fletcher tried to talk me OUT of working in the office. DOH! I hear mail being thrown unceremoniously on the porch! How do you like me NOW? Aren't I just the best dog EVER? And then this happened: Thank you Milo for being such a good box opener. And then THIS happened: Is this a contest? Or a relay race? Well, whatever it was, it was a long, tiring day at the office for my assistants. Know what was in the box? Dog grooming supplies, which after all that work did not amuse them. Bwaaahahahaha! Stay warm everyone and watch for our update on the sheep's website ok? Smooches from the crew! From all of us at The Homestead! Jim, Sandy & the Sheeps www.homesteadwoolandgiftfarm.com ...where sheep may safely graze. We are all working together (?) this weekend to add a bunch of new items to the sheep's website. Keep an eye out and be sure you are on both our mailing lists ok? PS- at least they didn't try to put the Christmas lights up for us too- or worse yet, push the lights out the kitchen window to the SHEEP right? OH my. We live in a rural area and I was so very sad to learn how many homeless people we have in the Monroe area. I am very disappointed to see our U.S. Veterans lost to the streets. It just makes me so sad. It can happen in a second. To anyone. Many people do choose to remain homeless. But most would give a lot to have a safe place for themselves and their family to sleep at night. Some choose to sleep outside if the shelter will not accept their dogs. I've heard people write and talk about homeless people not deserving to have a dog or pet. That they cannot possibly be taking good care of them living on the streets. Those are the people who do not see people feeding their dogs before they themselves eat. Wrapping up in any blanket they can find just to keep that living soul close and warm. Those dogs are often their last 'thing' on earth and when that happens, the dog becomes much more than family. Much much more. They are the only comfort that person has left. I'm pretty sure you've met our Fletcher, the Great Pyrenees puppy by now. We've had him a few months now and this is his story. My wonderful Mom volunteers to walk dogs at the county shelter near her home. We had already adopted our Pyr Teagan from the shelter. Then this little puppy came along. I do not know much about Fletcher's prior person. I kept an eye on the puppy and offered to take him. Then his owner came to retrieve Fletcher. All the way from some place far away- on a bus. He loved his dog. It turned out this man did not have a home. He was sleeping on the streets and his soul was this beautiful puppy. I think one of the shelter gals was dropping off dog food to him to try and help them out. One day, that brave, sad man came back to the shelter to leave Fletcher there for good. He said he could not make Fletcher live on the streets during the winter, he could not afford to feed a big dog or have regular vet care. The shelter gals told him they already had a good home for his puppy but we all know that doesn't help much when you are leaving your soul behind. To trust a stranger to love and keep your dog. I know nothing else about this man except for what I learned from Fletcher. That puppy has the best manners- most of the time. He was only 13 weeks old when we adopted him. He already knew how to shake, high five, sit, down and of course the ever important 'no.' He also loves to be brushed. I can see the time he put into his puppy to raise such a good citizen. Things he does are hilarious and we stumble upon his tricks and such always by accident. When we adopted him, his name was Jim. Since my hubby's name is Jim we re-named the puppy Fletcher. A special family name in the Ryan family. We figured Jim was young enough to learn a new name. Not. Just the other day I was getting frustrated because Fletcher would not respond to me. That is definitely a Pyr trait but he was taking it a little over the limit. Finally I said JIM no. That puppy sat his little hinder down, looked over his shoulder at me like, hey, gotcha', aren't I a good good boy? Wow. I don't know if Puppy Jim's person will ever read this, but we will never forget how hard it was for you to let him go to a new home. We love your puppy. You did an amazing job raising him. We will be forever grateful for him and love him all his life. My wish for Christmas would be that if you see a homeless person with a pet, how about stopping to help out with a bag of dog/cat food. A warm meal. Or leave a bag of dog food off at a food pantry. There are also many veterinarians who have pet food pantries now. Thank you all for everything you do for our sheep every day. We would not be where we are today with out you. We truly appreciate each and every one of you. ...There but before the grace of God go I.
Jim & Sandy Ryan and all our sheep, llama, horse and chicken family www.homesteadwoolandgiftfarm.com ...where sheep may safely graze. 16 inches of snow? Milo, Teagan and Fletcher love it! - this is our 'walk' today. (nobody was hurt during our walk- this is how Great Pyrenees dogs play. Teagan also took her opportunity to teach Fletcher some manners, even though he is not her puppy. It all looks and sounds rough but they really are just wrestling and having fun fun fun!) Three very tired Muskapyrs! Have a great week everyone! Smooches from the flock! And a good one at that! 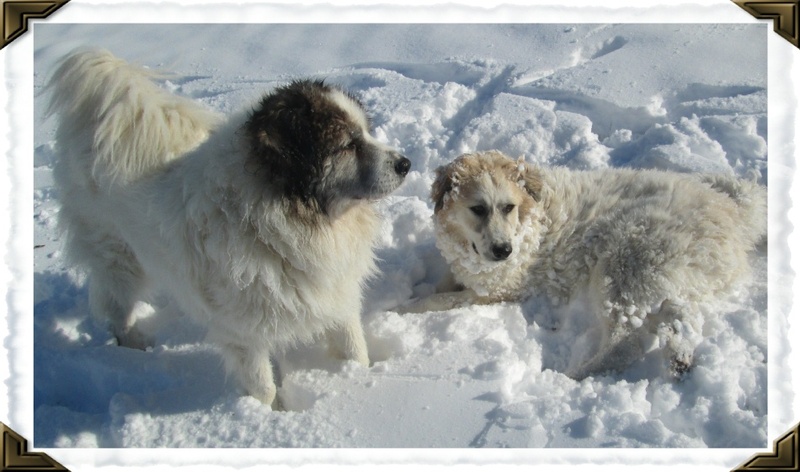 Here is a post that is mainly pictures of our pack of Great Pyrenese dogs and one deaf Border Collie. Let the photos commence! Whaaat? A new puppy? Heidi Grace is not too sure this is fun but Fletcher is winning her over- slowly. She is our full time watcher of sheep. She likes to come inside for a nap during the day and some brushing of her beautiful self! This is puppy Fletcher- he has lots to do, lots to do! Fletcher is 14 weeks old -and wonderful of course. He came to us as a deaf dog, who turned out NOT to be deaf! He was just being a Pyr. They are notorious 'I can't hear you' dogs. His previous owner taught Fletcher to sit, stay, lay down, shake hands, high five and the ever important word- no. All the hard puppy work was already done for us. Our Noodle the deaf Border Collie. She can hear loud noises but like the Pyrs, she has very selective hearing- ha! She is 10 years old and a silly girl. She's not too sure about a new puppy..... This is how Noodle behaves when she doesn't want to be seen. If she can't see us, we certainly can't see her right? Looked like fun so Fletcher gave it a try too. 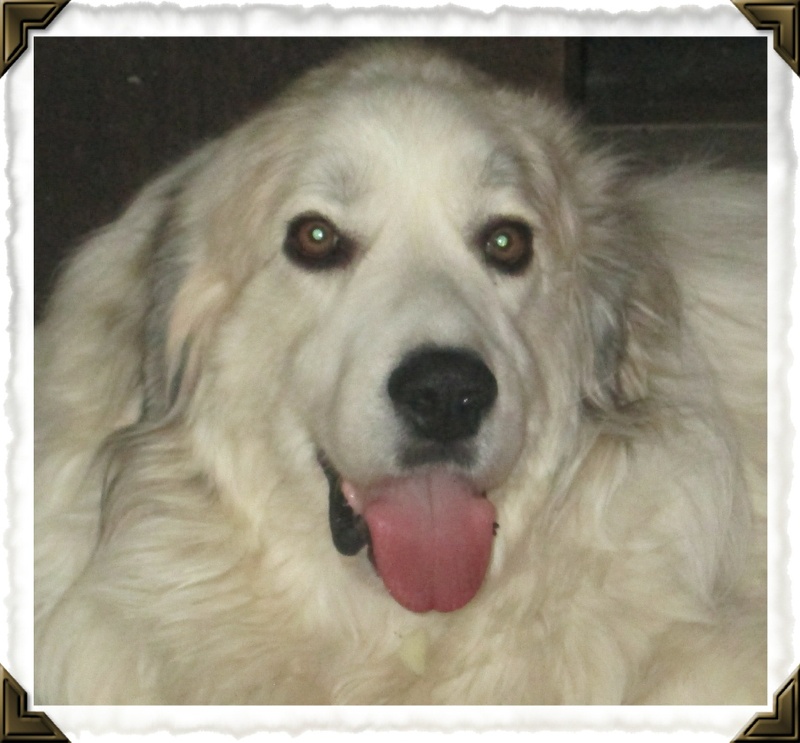 Teagan is a wonderful girl, a Pyr who we think is around 6 years old. We absolutely adore her too. She is such a good dog. She love toys and napping on the couch. She does like to work watching over the sheep-during the day. She barks and barks in the favorite Pyr look out spot. However, this is her bed. I don't have the heart to tell her she doesn't quite fit. Teagan has become good friends with puppy but it took him a while to convince her to share that awesome bed. This is what happened at first, then Fletcher just started hopping into bed by flopping down right on top of Teagan. Doh! There is always a mad dash for the bed and/or couch when the dogs come inside. This 'win' went to puppy! This one to Teagan! Here we have Milo. He has a misshapen mouth so his tongue doesn't stay in his mouth all the time. He is adorable and slowly learning to be a good sheep guard. He is a very sweet, kind dog and he's one of our 'Pack of Three.' Teagan has taken over as Fletcher's mom. They play and run like TWO puppies. Milo gallops around with them but hasn't joined in the play time yet. He loves to run. Noodle is definitely not part of the Pack of Three. The third party was unwilling to give up his place in THE bed when I took this. Fletcher is behind Milo. Where did papa go? When the day is over Heidi Grace goes outside for night duty. Milo sleeps upstairs in our bed- ugh. Noodle sleeps on the floor next to the bed. I've been sleeping on the couch to keep an eye on Fletcher. (I don't sleep much any way!) He sleeps as close as he can to Teagan. This is one tired puppy at the end of the day! I would love to just scoop him up but he says he's too grown up and doesn't want hugs like that. How embarrassing! They definitely keep me on my toes. I'm the 'bad parent' as soon as Jim gets home from work- that's gratitude for you. Hope you are all having a wonderful week- slobbery smooches (did you know Pyrs are slobbery?) from the pack! Jim and Sandy Ryan www.homesteadwoolandgiftfarm.com ...where sheep may safely graze. The shepherd’s dog is remarkable for its intelligence and sagacity. Far up among the hills, as well as in the green valleys and lowlands, he may be seen guarding and watching his master’s sheep. All over the hills of Cumberland, the mountains of Wales and of Scotland, and in many other parts of the world, thousands of these valuable dogs are to be found. Without them it would be almost impossible to make use of mountain pasture lands. Not many years ago there lived a Scottish shepherd poet, called James Hogg, who tended his sheep among the green hills and sweetly-flowing streams of the south of Scotland. He had good means of studying the habits of the shepherd’s dog. He mentions that at one time he had a dog called Sirrah—a very extraordinary animal in managing a flock. One of his exploits was as follows: About seven hundred lambs, which were once under his care, broke away at midnight and scampered off in three divisions across the hills, in spite of all that the shepherd and an assistant lad could do to keep them together. “Sirrah, my dog,” cried the shepherd, in great distress, “they’re a’ awa’!” The night was so dark that he did not see Sirrah; but the faithful animal had heard his master’s words, and without more ado he silently set off in quest of the runaway flock. Meanwhile the shepherd and his companion did not fail to do all that was in their power to recover their lost charge. They spent the whole night in searching the hills for miles around; but of neither the lambs nor Sirrah could they obtain any trace. Another strange story told of a shepherd’s dog is as follows: A gentleman sold a large flock of sheep to a dealer, who had not the men to drive them. The seller, however, told him he had a very sensible dog which he could send to assist him to a place about thirty miles off; and that, when he reached the end of his journey, he had only to feed him, and tell him to go home. The dog soon after got his orders, and set off with the flock and the drover. But he remained absent so many days that his master became very uneasy about him. One morning, however, to his great surprise, he found that the dog had returned with a very large flock of sheep, including the whole of that which he had lately sold! The fact turned out to be this: The drover had been so pleased with the dog that he had resolved to steal him, and had locked him up until he should be able to leave the country with him. The dog grew sulky, and made various attempts to escape. At last he succeeded; and, strange to say, went at once to the field, gathered the sheep, and drove them all back to his master! Wonderful, however, as the Scottish shepherd’s dog is, there is a dog in another part of the world more wonderful still, because it is itself the shepherd! In some parts of South America there are sheep dogs which are entrusted with the care of flocks without any master to direct them. They go out with the sheep early in the morning, of their own accord; and they keep beside them all day, driving away the birds of prey that would attack the lambs, and the wild dogs that sometimes came in packs to worry the sheep. In the evening they bring them home, taking great care by the way that none of the lambs are too tired to keep up with the flock. If they become tired, and begin to lag behind, the dog shepherd will go and fetch them, one by one, carrying them gently in his mouth, until they are safe in the fold. The means taken to train these dogs to their work are curious. A little pup is brought, before its eyes are open, to a female sheep, and is fed by her several times a day. A wooly nest is made within the sheep pen, and the little stranger is laid within it; so that, when it creeps out, and begins to play, it has no other companions than the lambs of the fold. They thus become its brothers and sisters. As the animal grows up its delight is to be always with them to watch and protect them. ***I loved this as soon as I read it in an old primer/reader. What fun to share stories from so long ago! ** Hope you enjoyed this little snippet! 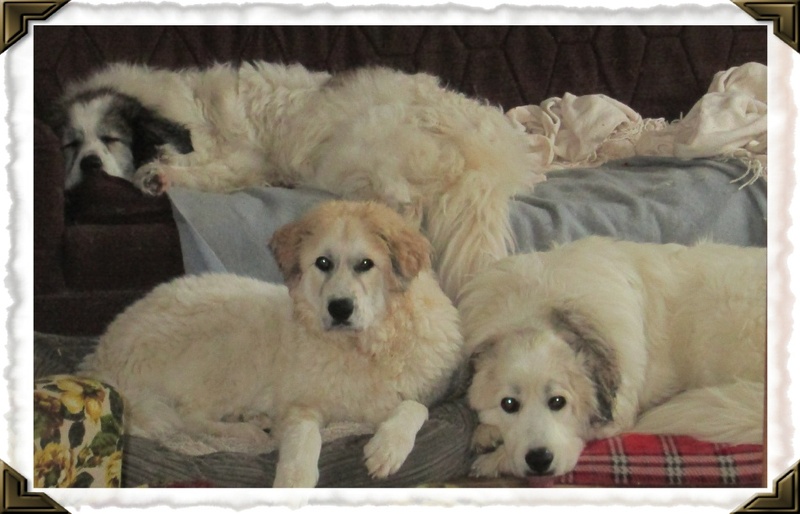 We love our dogs so much and without our crew of Great Pyrenees dogs, I would never sleep. 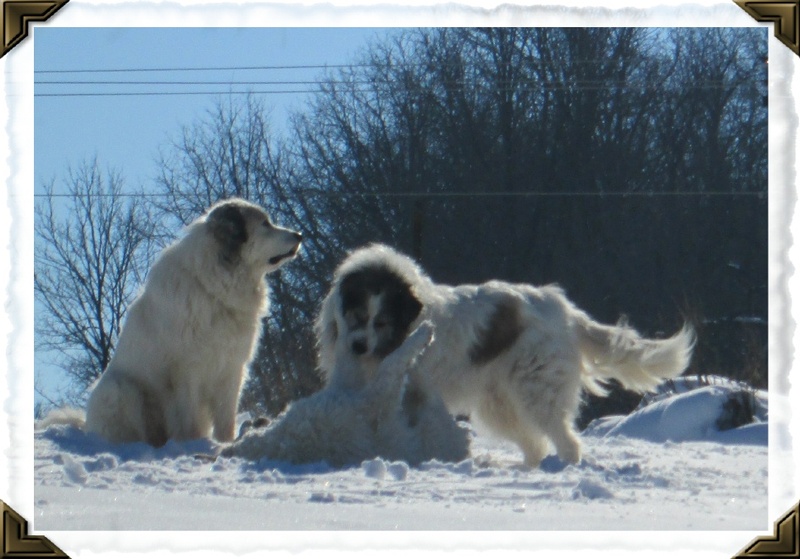 The bad guys (coyotes) come too close to our farm, but no worries when the Pyrs are on guard... Smooches from the sheep- have a great weekend! Jim & Sandy Ryan www.homesteadwoolandgiftfarm.com ...where sheep may safely graze. life is not what I think it should be on the farm. No sheep should ever leave me OR be a senior citizen. 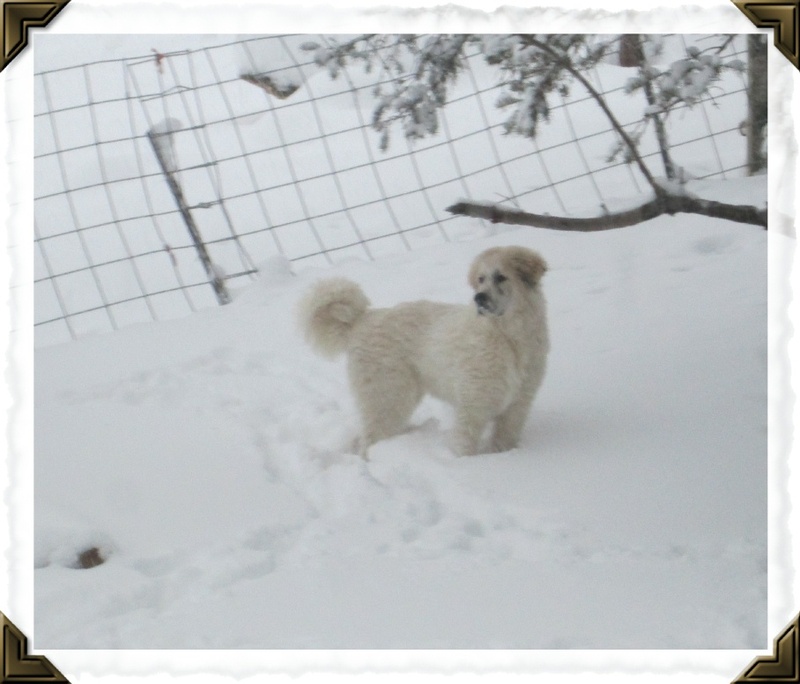 (Don't have it in me to call any of our critter family 'old')Most of you know we had to send our Great Pyrenees Bobbi to the big pasture in the sky recently. We miss her so much. She took wonderful care of our sheep, along with her brother Andrew, for 12 years. That is definitely old age for a Pyr. I am sure she and Andrew are busy busy keeping their old friends in line! When I lose someone, I barely get time to grieve. I always cry even considering a new dog or even looking at ads for a new dog. BUT, Bobbi would not want her sheep friends unprotected from the 'bad guys.' (Coyotes- lots of them.) So I have to get my act together and keep an eye out. This is our new Pyr Milo. We drove to southern IL to pick him up and he's having a bit of culture shock. He's 3 years old and when he met Jim, I turned into the invisible woman. It was so sweet to see Milo take to Jim so quickly. Aren't they cute together? I think I'll keep them both! Ha! So there was no leaving Milo! We had no intention of leaving with out him anyway. We were told he was 'around sheep' all his life. He had all his vet work current and, he is just gorgeous! It was a long car ride home and a very difficult, scary time for Milo. I can't imagine how sad he must have been to be moved from everything he grew up with. And his best friend Moose the Newfoundland. When we got Milo home, we found he has some issues. His mouth does not quite fit together so his tongue hangs out. He is adorable but I wish his teeth fit together better. We have to feed him soft food and we'd like to see him gain some weight. He is very timid and we are depending on Heidi Grace to help us train him to stay with the sheep. Houston, we have a fence climber! We will be installing a radio fence this weekend to cure that habit! Stinker! Every animal who finds us is like a puzzle. Each day we find things out about them that make it easier to ease their worries and teach them what we need them to do. Right now we have to keep this cutie inside when we are not out there to monitor his activities. His hips are not the greatest but in addition to climbing our fences, he has also climbed a tree to get over the fence to visit Henry & Niles? He is very determined! He's having separation anxiety when Jim is at work so that is what I am working to ease first for Milo. We take walks with the sheep, with Heidi Grace, Teagan and Noodle. The girls are showing him the way and I know that is how Bobbi would want things to be. I don't think Milo will ever be able to work alone in Bobbi's group but we'll see. Until we know, or find a working pair of Pyrs, Dalai Llama and Chaquita llama will be coming back to work in Bobbi's group of sheep. Keep an eye out for updates about Milo. I think this adventurer will keep us on our toes! Hope all is well with all of you! We'll be updating the website this weekend with lots of fun fiber and painted items- keep an eye out ok? Smooches from everyone! Sandy and Jim www.homesteadwoolandgiftfarm.com ...where sheep may safely graze. Can YOUR 130+ pound WHITE dog hide from YOU? Our Heidi Grace the Great Pyrenees believes she can.....I see Monroe, I see Heidi's little toes... Now I even see her nose! Is that a 'sheepish' face or WHAT? Actually, when Heidi Grace is not out with her sheep sleeping under the porch steps is her favorite 'hiding place.' The cement under them is a nice cool place to sleep on these hot summer days. However, here is her usual day time nap space! Notice she leaves not one bit of the couch to share with anyone else tired though! Heidi Grace watches over our oldest and special needs sheep at night. She's a very good girl and does love her naps inside during the day, or if we have storms that include thunder. She's not really afraid of the thunder, just prefers to be where I am if it gets noisy outside. And of course I never complain when she wants to be inside with me, even if she does hog the entire couch! 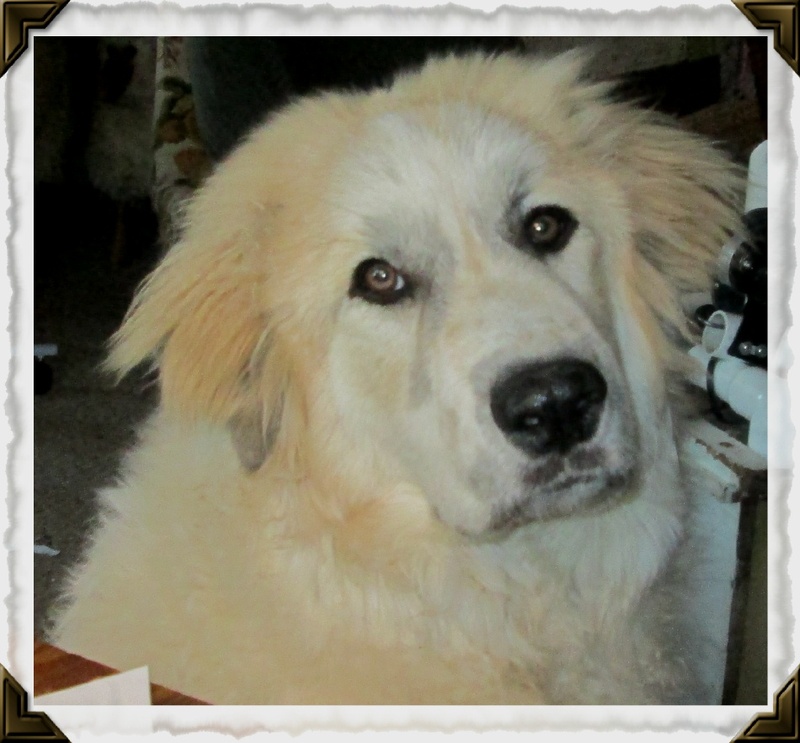 Hope everyone is having a great week- watch for our next post of our new Great Pyrenees Teagan! Chat with you very soon! Jim & Sandy Ryan www.homesteadwoolandgiftfarm.com ...where sheep may safely graze. Break out your water wings my sheepies! First let me say, our thoughts go out to all the people in Texas and areas surrounding as they try to deal with the awful weather they've had for weeks now. We are definitely not in Texas and nothing has happened here that is on the scale of the Texas weather. However, check this out. I was out in the barn with the vet taking care of a sheep. Took about 20 minutes. It poured down rain the entire time we were in there. We call the waterway that naturally runs between the house and barns the River Ryan. You've probably heard me talk about it in the past. The River Ryan was running when we went inside, but only up to maybe my ankles. When we were done with my sheep and came outside, THIS is what was waiting for us. We are in a valley- at the bottom of every hill. We joke about the River Ryan. It's usually just a little stream of water trickling through when it rains. We have drain tile installed to direct the water out to the big pasture. Once in a while this is what happens. In 20 minutes our little River Ryan was knee deep and I can see now how people and cars get swept away so easily. I was more than a little afraid to cross that water. There was water coming from all directions around the barns and it even sounded like a river thundering along. The vet parked his truck next to the blue trailer and was still 5 feet or so away from the water. By the time he left, his truck was almost up to its bumpers in the water. I swear it was starting to float but by that time I was so freaked out I am pretty sure I was seeing things. He got on his way just fine, stayed to make sure I did not get stuck or floating off down the river. It was scary. SO, no playing in the water my sheepies. They are generally not an animal that appreciates water but my sheep think of some pretty silly things to do. Maybe I should build a life guard stand? More rain coming a little later this afternoon so maybe I SHOULD go get their water wings on? And take many pictures of THAT! Stay safe everyone- watch out for flood waters- safe travels if you have to be out and about! Jim & Sandy Ryanwww.homesteadwoolandgiftfarm.com...where sheep may safely graze. A few weeks ago we had some mega-monster storms rip through our little valley. When Jim went to feed Bobbi (our Great Pyrenees) in the morning, a little red and white Border Collie showed up out of nowhere? We thought we had seen her before but were not sure which neighbor she belonged to?Well, until we could find out where she belonged, I made up a comfy bed of sleeping bags, put some water and treats out for her- and went back to bed. After all it WAS 4 in the morning. It did register with me that we had a few more storms roll through but went back to sleep. They were much less severe, just regular old storms. Well, I think Rosie had a different thought on what a regular old storm is? Holy crap! I couldn't find her, the glass door on the enclosed porch was still closed so she had to be in the house? Rosie turned up- out from under a pile of fleeces in the fiber palace (aka basement). She picked a good place to shelter from a storm but whoa. She was so sad and embarrassed and I couldn't find it in me to be mad at her. She was just scared. I called the number on her tag and the vet said Rosie belonged to our friend and neighbor on the other side of the hill. They were very glad to know Rosie was fine and picked her up later in the day. Bob said Rosie is terrified of storms and will chew through anything, even inside their house, to hide. Bob was wonderful, replaced the door and did all the work for us. Thank you neighbor Bob! We did need a back door but just hadn't gotten to that project. We suggested that Bob bring Rosie down the next time it storms. We would love new kitchen cupboards too! Tee hee hee! Hope all is well with all of you- the sheep are having fits waiting to get out on the new grass. Just another week peeps! Smooches from the sheep everyone! A foot of snow & shearing day! Hugs and smooches from the sheep! Jim & Sandy Ryan www.homesteadwoolandgiftfarm.com...where sheep may safely graze. It was a new experience around here last weekend! During all our years with sheep I never knew there were crews that came in and just trimmed sheep toes? WHAT? That is the biggest job for us now that our son moved out. Feels like most of what we do is trim sheep toes and it's hard to get other things done. Eek! There is SO much to do here! Chatted with Therese and decided to give them a try. Her hubby and his crew arrived about 9 in the morning and we had the sheep locked inside awaiting their spa day. It was chilly and I am pretty sure they thought it was shearing day. They were not ready to give up their warm wool yet. Jeff (hubby) did the toe trims and his crew of 2 held the sheep. We used a sheep hammock to set the sheep down comfortably. Then the trimming began. I gave the sheep their vaccinations, wormed them and then their feet were treated with some good meds to keep them healthy. Jeff and his crew were very patient and kind to the sheep. Avi had a crush on Trevor- she just kept on leaning over and wanted to snuffle his face. Tee hee. I'm not sure he was too happy about it but he was a good sport! . Several of the sheep even took a nap in the sheepie hammock during their appointment? Good sheeps! I loved the fellow holding the sheep's head. He talked to the sheep, asked each of their names and even sang some songs. (We were getting a little punchy by the end of the day.) This would be Piper, waiting his turn, giving me the stink eye. He's usually so easy going but not that day. He told me the girls were telling the boys all week that they would have to wear brightly colored nail polish? I promised them it was not true but sometimes they don't trust me? Tee hee! We split the sheep into groups who needed additional treatment (only about 10!) and the rest went back to their regular groups. It was a long day, as long as a shearing day. It was so worth it though. Now we'll have the crew back in October and things will be much easier for Jim and me. We'll just be watching out for anyone limping in between appointments with the crew. This also saves us an amazing amount of time on shearing day! Another benefit! They already have their spring shots and worming, toes trimmed- all we will have to do is put their spot on anti-tick med on after they are sheared. I'll be curious to see how much faster shearing day goes? Giddy UP! At one point poor old Bobbi got on the wrong side of the barn door. She gets very worried when strangers are around her sheep. I let her in and she found a comfy spot to have a nap. I adore that dog. She's so sweet and so dedicated to her sheep. Hope you are all seeing a glimpse of Spring? We are here but do not trust it yet! We'll post updates as we find new ways to work with our flock on our own... (our son moved out a few years ago so we are in a new phase here). Smooches and hugs from the sheep with happy feet! A sheep with nine lives? You may want to go get yourself a big cup of coffee- we need to go back a ways to explain THIS sheep! Shortly after we moved to our farm 10 years ago, we got a call from a farm animal rescue in Pennsylvania. They asked if we had room for any of the sheep they were working to re-home. We agreed to adopt 12 of the sheep-one gave us the first lamb ever born on our farm shortly after they arrived! They were 12 of 150 sheep that needed new homes. 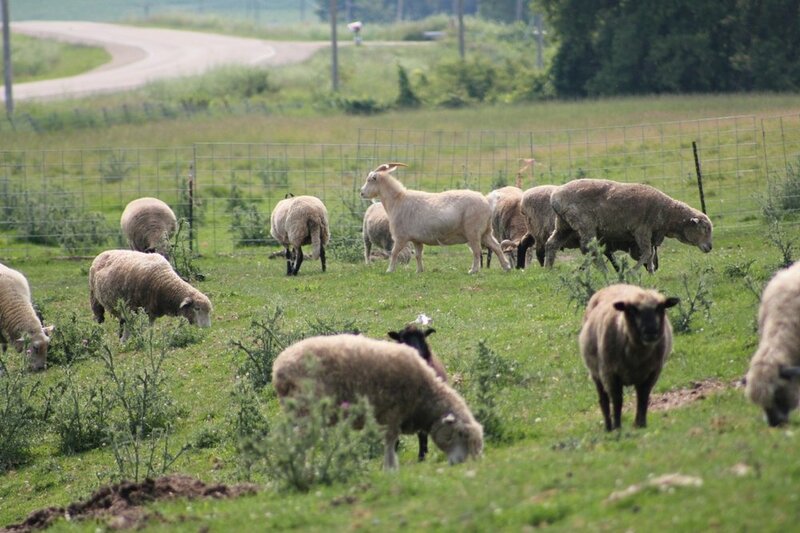 It makes me proud that we helped them re-home over half of the sheep into safe homes right here in WI. But we need to go back even further. The sheep belonged to a retired dairy farmer and his wife. They missed having animals so decided to raise a small flock of sheep. They had plenty of land so the sheep would have a nice big pasture with some trees for shade. He was advised by someone to start his flock with Merino, Icelandic and Romanov sheep. What he probably didn't realize is Romanov sheep are known as 'lambs by the litter.' He had trouble keeping up and finding help when it was time to fix the boys, vaccinate or do any vetting of the sheep. Within 5 years his flock had exploded into over 150 sheep. The rescue took in every sheep, trimmed their feet, sheared, vetted all and fixed the boys. What a job that must have been right? I wonder how long THAT job took? If we're counting (and we are), I think Foster (and family) used several lives before they even got into the rescue! And what a shock for those poor sheep who had not seen people or been touched by people. The sheep joined our flock in November- cold in WI! They stayed inside the sheep barn to stay warm AND to let them learn to trust us. Since we have sheepie break outs every once in a while, they also needed to be 'bucket trained.' All of our sheep will come back if you have a bucket in your hand. In an emergency just a few rocks rattling around in the bucket will work. But you better move it when they hear it. Otherwise you are toast! And you better run faster when they realize you tricked them with ROCKS! 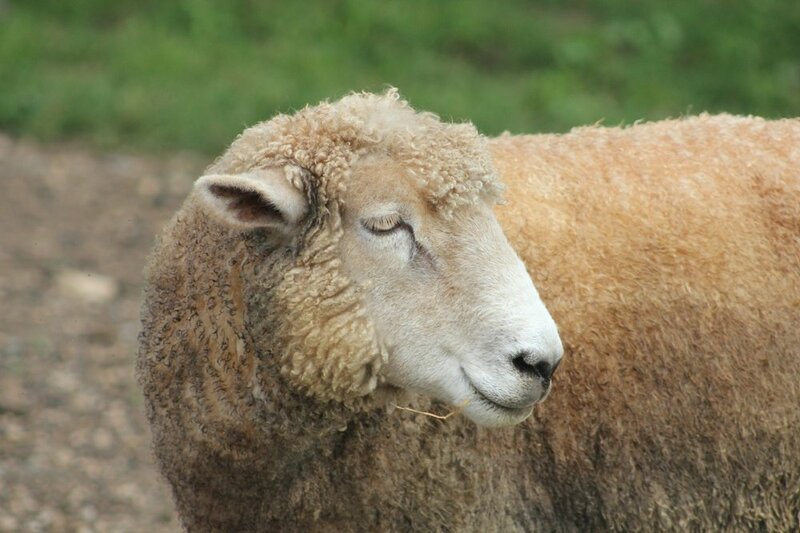 Now we can move forward to Foster sheep at the Ryans and count up another life used. Two years ago it was 50 below zero, the coldest January we've seen in years. It was windy, bitter and just AWFUL. Even if you are a sheep. We feed big round or square bales of hay to accommodate a larger flock. We are VERY careful to make sure we get all the strings cut off the bales so nobody gets caught up in them. Well, we missed a string and Foster got his horn caught up in it. Luckily Jim and my friend Sara found him. I thought I would lose that sheep. He was so cold. We put bedding and blankets in the milk house and settled Foster in. We run a heater in the milk house all winter to keep the water hydrant from freezing. It was a warm place for him but I was so upset that he was so cold- even though Farmer Sandy knows it only takes a minute in that weather. It took a few days of warm and I went out, there was Foster on his feet, looking at me like, hey, let me the heck out of here! I thought I would be the one to die! That is a moment like no other. So Foster went out and went on with life number whatever... Then THIS winter, Farmer Sandy who adores her sheep was out on her daily visit/walk with the sheep. Someone was missing. Foster did not come up for his vanilla wafer? Of course, panic set in. That's always my first reaction. I found Foster laying on his side and he could not get himself rolled just right to get up again. He was not cold but he was upset. How embarrassing. I picked him up to set him on his feet. Instead of leaning on me for a few minute so his legs could wake back up, he tried to leap up and run away. Down he went. What did I do? I became Farmer Sandy with a mission. And a new black sled. Lucky for me our neighbor showed me how to haul a heavy animal to the barn by myself. I carefully tipped Foster onto the sled and hobbled his legs so he wouldn't jump out. Then, albeit slowly, Farmer Sandy with a mission hauled that sled full of 200+ pound Foster sheep all the way to the barn, inside AND got him set up so he was laying propped up. I feel the need for a cape with Farmer Sandy on it? Could it match my Princess of Poop Scooping tiara? In the mean time, Bobbi the Great Pyrenees took our little old stinker Shetland sheep Becan out for a romp in the front yard. Sigh. Happily skipped out and got them back inside. Bobbi does take an occasional jaunt around the yard and she comes back when she knows we are ready to feed her supper. Becan usually comes back to the wiggle of a bucket but he was not so ready to comply. Old Farmer Sandy (who was by then out of energy) had to literally drag Becan, who probably only weighs 100 pounds, out of the chicken coop. He knows they always have corn in their feeder. It is just too tempting and Becan is just a smarty pants anyway. I got them back in the barn just in time to see Foster on his feet? He was a little wobbly but standing up. I left so he would stay inside if he fell over again. He is an old fellow after all. I checked on Foster in the night and he was fine. I had to pick him up again the next morning but after that, he was done needing help. Huzzah! Foster is back to living his sheep's life with all his friends. Specially his best buddy Jonte the Jacob sheep. They are good friends and spend their time chasing the other sheep around in their version of tag. Knock on wood, Foster is fine and I hope he has no more troubles. We have no idea how old he is but he sure has lived a full life- with a few scares built in. Farmer Sandy could happily live with out another incident- I'm talking directly to you Foster! Besides Foster we only have two of the sheep from his family left in the flock. Heidi (left) is so old and we have her inside for winter in the warmest condo in the barn with her friends Violet and Gabriella. Bettis (right) is also who knows how old. A few years ago he completely lost his vision so he lives with the tiny group of special needs sheep. They have a smaller pasture and that way he doesn't get lost. We miss the rest of Foster's family so much. We are glad we could help them have a happy, safe place to live out their lives-how many they may have led. PS- Big Kitty, where are you? I love you so very much. Please come home. You might remember the sheep my friends Mary & Joseph adopted a last fall? Please excuse the recap, I still think it is cool and what a journey! Before- full of burrs and tons of heavy wool. Sheep can get bogged down in snow and rain with that much wool. It gets wet and they can't move. During- we sheared them right away. They were healthy under all that wool, no bugs and they were, let's say, 'well fed.' Took us around 6 hours to shear all 3 sheep. Once they figured out what we were up to, and how great it felt to feel air on their skin again, they even had a snack while being sheared! One fleece! Happy, clean sheep! Pretty wool that was next to their skin. I truly adhere to the 'no locks left behind' rule. 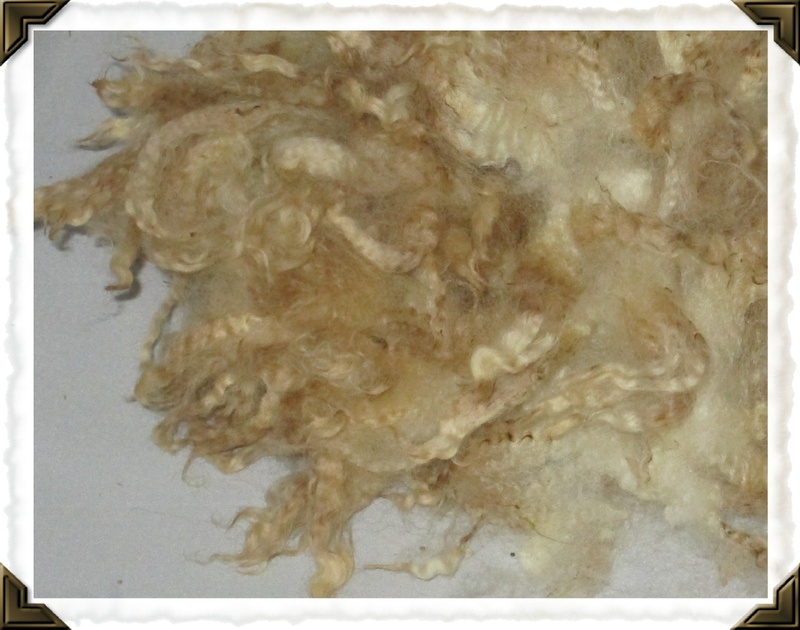 This is what a fleece looked like on the inside (next to the sheep's skin) but the outside was felted around TONS of burrs. When I went to visit my friend Heidi, we spent 2 hours trimming away the felted matts and burrs. This is how much wool we ended up with. It is soft and gorgeous! I am guessing it had been 3-4 years since the sheep had been sheared last. (The wool is whiter than the picture- don't forget my photographic abilities stink!) I haven't decided what to do next with the wool. There are breaks in the locks but even broken, the locks still measure 3-4 inches long. Hmmm. Right now it is washed and awaiting my decision. Thoughts anyone? Of course I want to spin it but what do you think the yarn would be like? I'm sure it would be a beautiful yarn, but would the breaks make it pill in a project? Thank you for stopping by to see the sheep's adventures!